I had a chance to listen to an early version of the SVS Prime Wireless speaker at CES, and was very impressed with the clarity and centering imaging of the pair in stereo config. Sounding good isn’t the only trick these wireless speakers have on offer however, as they also provide the good stuff available from the DTS Play-Fi platform. This translates into direct access to (i.e. no mobile device required) to a plethora of online streaming services and home media server (I assume DLNA, but will have to ask about this). It’s not all about the 50w x 2 driver setup (per speaker) here either, as there is a 192KHz/24-bit DAC doing the heavy lifting. SRP will be $600 for piano gloss (yum) with an expected ship date ~October 22. Update: Play-Fi does support DLNA servers for local playback. There is a lot of information on the DTS site around this, including preferred servers (Plex, Serviio, Twonky, Logitech Media Server). File type is also robust (e.g. mp3/FLAC/aac) so it looks like all the bases are covered there as well. SVS Launches Prime Wireless Speaker System. At Last, Convincing, Immersive Sound Goes Wireless. An active-passive two-channel speaker array sporting advanced connectivity via WiFi, Bluetooth, line level and more, marries up with a 200-watt (50 watts x 4) amplifier, powerful 192KHz/24-bit DAC and precisely tuned digital crossover, to bring audiophile sound quality to the wireless smart speaker category for the first time. Youngstown, Ohio – October 3, 2018 – SVS, manufacturer of high-performance speakers, subwoofers and audio accessories, proudly announces the SVS Prime Wireless Speaker System as part of the new Prime Wireless family of products from the American audio brand. The SVS Prime Wireless Speaker System delivers crisp, accurate and full-range sound with stunning dynamic impact and true stereo imaging. The active-passive stereo speaker array is a major enhancement over the unconvincing virtual stereo output from ordinary wireless smart speakers. Cost-no-object acoustic design is married with smartphone, tablet and voice control via Amazon Alexa; WiFi and Bluetooth connectivity, direct access to the most popular music streaming services, a wide range of inputs and outputs, high-resolution multi-room streaming, custom presets and more. From reference sound quality to the intelligent control interface, Prime Wireless is a seismic leap forward for smart wireless speakers. Pristine sonic fidelity is achieved through a combination of true stereo separation, a powerful 200-watt (50 watts x 4) internal Class-D amplifier and a sophisticated 192KHz/24-bit DAC. A digital crossover within the DSP allowed SVS engineers to precisely control the signal power distributed to each individual tweeter and low frequency driver resulting in a much broader soundstage with deeper, more powerful bass than one would expect from such a compact speaker system. Control of the SVS Prime Wireless Speaker system is seamless and flexible. Users can access music and adjust volume and other settings from their favorite seat or while moving around the house using the WiFi connected app. Voice control of music is possible through Amazon Alexa devices so users have a “hands-free” option for controlling volume, multi-room playback, streaming sources and more. Dual-band WiFi and Bluetooth with aptX and AAC enable high-resolution wireless streaming from multiple iOS, Android and Windows devices without interruption. Unique to the SVS Prime Wireless Speaker System are six front panel presets that provide instant access to a user’s favorite Spotify or Pandora playlists, Internet Radio stations and other streaming music services without needing a phone or tablet, since they stream directly from a home’s WiFi network. Users simply program the presets and then push the left front dial to toggle between their favorite audio content with a single tap. Through the DTS Play-Fi platform, the SVS Prime Wireless Speaker System gives users direct access to music and entertainment streaming sources, including: Spotify, SiriusXM, Pandora, Amazon Music, iHeart Radio, Tidal, Internet Radio and many more. All can be streamed directly from a home’s WiFi network with no mobile device connection required. The DTS Play-Fi app also lets users access streaming services, radio guides or a home media server from any smartphone or tablet and distribute it across the home to as many as 32 different products in 16 zones. For the most discerning audiophiles, the platform features “Critical Listening Mode” for streaming lossless high-resolution (24bit/192kHz) file playback. Abundant connectivity options in the SVS Prime Wireless Speaker System unlock endless versatility. Optical and line level inputs can be connected to computers, TVs, gaming consoles, CD players, AV receivers, mobile devices and more to provide a bolder sounding option than soundbars and a more affordable alternative to AV receiver/speaker systems. It can even serve as wireless rear surround speakers connected to a DTS Play-Fi enabled soundbar. Plus, unlike closed-network wireless audio systems, Prime Wireless integrates with hundreds of other DTS Play-Fi wireless audio products from many different brands. True stereo separation is vastly underrated as a factor in sound quality. Compact “all-in-one” speakers do music an injustice because the pseudo-stereo approach lacks the ability to render pinpoint imaging where instruments, voices and sound effects are heard emanating from a specific location in space. With its powerful DAC, precisely tuned digital crossover and true stereo separation from the active-passive speaker array, the Prime Wireless Speaker System presents an accurate and convincing stereo image with crisp dynamics, neutral voicing, a broad soundstage and powerful dynamics. The SVS Prime Wireless Speaker System is many things. 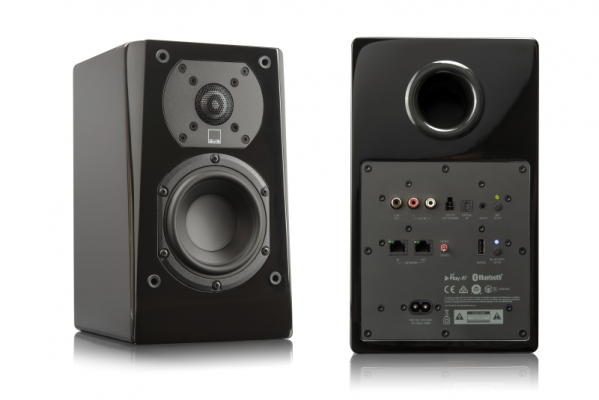 It can be a wireless hifi stereo system, play on a desktop with a computer or tablet, connect to a TV for more immersive home theater sound, or be used as part of a multi-room, whole-home audio system. Users can also leverage multiple connections at once and use the Prime Wireless Speaker System as the primary source of audio playback in a smart wireless audio zone. The SVS Prime Wireless Speaker System features a high-end Piano Gloss Black finish. MSRP is $599.99, pre-orders are available here: https://www.svsound.com/products/prime-wireless-speaker-system. Estimated shipping week of October 22. The SVS Prime Wireless family of products also includes the new Prime Wireless SoundBase, a powerful component that transforms conventional speakers with high-resolution wireless audio streaming via WiFi or Bluetooth, 300 watts (150 x 2) of amplification, advanced connectivity options and control via voice or handheld device. Line level outputs on Prime Wireless SoundBase can also convert any two-channel or home theater audio system into a smart wireless music zone. Prime Wireless SoundBase has an MSRP of $499.99.